As a result of my post yesterday about Ahad Miah, the Tower Hamlets First candidate who published a salute to Hitler on his Facebook page during last summer’s Gaza crisis (and who was later chosen to go on a DCLG-funded outing to Suffolk to “promote integration”), Mayor Lutfur Rahman has been in touch. 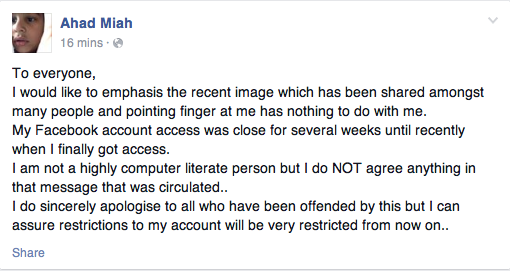 We were utterly unaware of Mr Miah’s alleged Facebook posting and deplore such postings. The Mayor has written to Mr Miah to ascertain what happened and to demand that this offensive posting is removed. Tower Hamlets First is proud of its record on standing up to racism and fascism and operates a zero-tolerance policy on any form of bigotry from its councillors and supporters. I’m writing in regard to an alleged posting on your Facebook page that came to our attention through the Trial by Jeory blog. I was shocked to see this as we at Tower Hamlets First have always assumed you supported Tower Hamlets First due to sharing our values – values to which strident opposition to racism is central. You will be fully aware that Tower Hamlets First has always worked to facilitate understanding among faiths and cultures whilst standing up to fascism, and that we have the deepest respect for our borough’s Jewish community. In a year when anti-Semitic attacks in Britain have doubled it is essential that we show our solidarity with and support for the Jewish community. With this in mind I would ask that you immediately delete the post and provide us with an explanation for the post. Racism of any form will not be tolerated in Tower Hamlets First. I would like to emphasis the recent image which has been shared amongst many people and pointing finger at me has nothing to do with me. My Facebook account access was close for several weeks until recently when I finally got access. I am not a highly computer literate person but I do NOT agree anything in that message that was circulated.. I do sincerely apologise to all who have been offended by this but I can assure restrictions to my account will be very restricted from now on.. I had to read it twice to make sure I wasn’t mistaken. But he really does seem to be saying it wasn’t him, doesn’t he? He’s implying someone else posted it and that he had no control over his account. As you can see that was posted on July 15. Clearly he didn’t disapprove of everything posted by this mystery hacker. I wonder who it could have been. Whether it’s enough to satisfy Lutfur, only the Mayor can say. Let’s put it this way: is it beyond reasonable doubt that what Miah is telling him is true? Which brings us on to this coming Thursday when Election Court Commissioner Richard Mawrey QC will finally deliver his own ruling on the reasonableness of Camp Lutfur’s belief last year that John Biggs was a racist. I think Lutfur would have jumped on Miah at any time he became aware of Hitler postings on his Facebook page, but coming just days before a decision that could ruin him politically and financially the timing is particularly sensitive. I was also verbally abused with antisemitic remarks last summer. 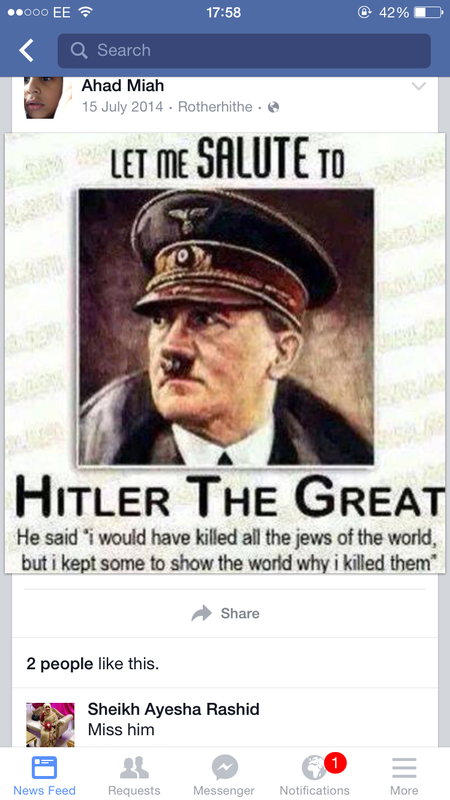 Whoever did post that image of Hitler on Miah’s Facebook page, I wonder how many others shared that view. Far more than people would admit methinks. What a shower of shite! I’ve seen similar postings on Miah’s profile for years, as have many others. Does he want to be proven a liar as well as a filthy racist hypocrite? I guess he’s in good company. Feel your political career slipping away….? My heart bleeds. As I’ve said, the truth had a habit of coming back and biting you on the arse. What’s next I wonder? Ironically, as vile as misguided as this was, we all know that this is just the tip of an extremely tainted iceberg that’s been sailing across Tower Hamlets for far too long! Let’s face it, they both need all the friends they can get. It’s like rats deserting a sinking ship. Self important little men who’ve grown greedy, arrogant and power hungry. To the point where they feel untouchable, above the law, and common decency. Ahad, do the right thing, stop lying and trying to weasel out of your rancid self inflicted hole and crawl back under your stone of obscurity. You have now become toxic, even to Loony Lutfur, Tower Hamlets’ version of the unholy lovechild of Robert Mugabe and Norman Wisdom – that really is some achievement! You’ve peaked, now bugger off! What a crock! Miah is a puppet and a simpleton. He is of no use to Lutfur and he will be hung out to dry, and rightly so. How dare he insult our intelligence! I have more screen shots of what he posts, and comments that he has made on them. Where do I send them to Ted? I too am computer illiterate and don’t know how to post them on here. Miah is also trustee of three charities, I wonder if they would like to know about his mentality too? Perhaps a question to the other trustees asking why they associate with Hitler admirers AND have the charities any plans to embrace any of Hitler’s philosophies including building gas chambers. Only if Lbth grant funded I’d guess. Though with Lutfur holding the pursestrings, nothing is out of the question! I do apologise because a unknown mysterious hacker invaded my web page and posted pictures of Adolf. For more than a year I never ever noticed these pictures of my hero despite viewing my web page several times a day. Because people like you saw these wonderful pictures, I am now going to increase security – not to stop people posting pictures of my hero – without my knowledge of course – but to stop all nosey-parkers like you telling the world what I am really like. How dare you invade my personal privacy. I love My Adolf. Crocodile tear from both disgusting men, not sorry for their actions, just being caught red handed! Just had a look through his page. What a considerate hacker, posting pictures of his family and indeed, Mr Miah himself visiting a friend in hospital. You get a better class of hacker with Tower Hamlets First. Say goodbye to your political career before it even started! I’ve done my research – St Hilda’s East (reg – 212208) with over £2 million turnover! Specifically targeting Bangladeshi older people. I wonder if they’re in receipt of any funding from Lbth? Conflict of interest springs to mind. I hear Ahad Miah is also a school governor…I wonder if it’s a state school, or something a little more specialised? I doubt if it’s Orthodox Jewish if that helps….. If it were Jewish Orthodox, they would not let him through the school gate. Like many affected by the Nazis, they possess an inherent aversion to that evil and to the evil’s admirers. My family suffered too and I’m not Jewish. Perhaps wolves crept in and slipped those vile postings online while he slept? I hear they’re extremely active at night, and very quiet. They’re very naughty animals. Poor Ahad, we really should be a little more sympathetic. How can something factual be an “alleged event” – either Miah’s heroes were on Miah’s Facebook pages or they were not..
It’s weasel words to say the least… and perhaps it exposes a truth which had hitherto been concealed. Perhaps Lutfur CAN’T go against the IFE because he is a puppet and they are the master? I sincerely hope he’s pulling strings and not wearing Ahad Miah like a glove! I never thought I’d be quoting one in Rhianna’s earliest hits, but it seems somehow fitting in this most unfortunate (for THF) situations of Mssrs Miah and Rahman’s own making. I’d suggest them singing it as a duet, with Ahad on a stack of Eastend Life editions looking wistfully into his idol’s eyes and singing mezzo-soprano to Lutfur’s baritone, with Rabina and Rania (The Lutfurettes) singing backing vocals. I misread CAN’T, and though this blog had described Lutfur. Alleged? It doesn’t take much detective work to notice that around the time of the Hitler posting, Miah was also posting photos of himself at events and with family. He says in his statement that he had no access to his facebook account until recently – lets hope his sorry ar*e gets fried! except for that trouble-maker Jeory ? on April 21, 2015 at 6:13 am Dave Roberts. So much respect in fact that Lutfur has been photographed at the Town Hall with a Muslim cleric who has described Jews as snakes and pigs. Zero tolerance on sticking to his promises and being truthful to the electorate is much closer to the truth! When will we wake up and have zero tolerance on this pathetic excuse for a Mayor and political party? Oh, and zero policy non Bangladeshis, expect for a few other dregs of humanity (un)Madewell spring to mind? Zero tolerance on fairness, honesty, spending our money well (by that I mean best value), stringing an unaided sentence together, keeping ones fingers out of the till, speaking at full council meetings, walking from A to B, treating us like the imbeciles and yes men in cheap suits that he surrounds himself with….need I go on? Walking from A to B ? Don’t be silly Grim Reaper. If he walks along a London street someone might kidnap him AND demand a ransom. Ooops, I have just be informed that he is a school governor too. I don’t know how true this is. Is it possible to find out? Normally democrat services at the council will instantly know or, as it is TH, connect you to someone who does know. Any suggestions what the judgement will determine ? 2. Election was NOT voided. 3. Nothing in the law that prevents the importation and adoption of dodgy election practises from Bangladesh. 4. Mr Rahman is a nice sweet gentleman. Whatever the verdict, we can rely on his promise of zero tolerance of bigotry from its councillors and supporters! Excuse me while I ring out my knickers, as I may have soiled my undergarments during uncontrollable fits of hysterical, no maniacal laughter! Is this man really a school governor and trustee of St hilda’s ( isn’t that part of Age UK?). How did our social fabric in TH come to be infused with people with such views? The Mayor must take responsibility for some of this – presumably he “sponsored” him. Hence the rushed letter and embarrassment. I wonder if there are others with such views? on April 21, 2015 at 8:15 am Dave Roberts. I have just been told that The Salvation Army received money from the Preventing Violent Extremism fund a few years ago. Does anyone know if any of this ended up in Stepney? Hi Dave, are you referring to the free money or violent extremism? I’m hedging my bets and saying oodles of both…. on April 21, 2015 at 9:52 am Dave Roberts. Apparently they applied for and got money for some kind of a programme dealing with the radicalisation of young Muslims. That’s all I know. What expertise they had in this field I don’t know either. Most of the money of course went to extremist Islamist groups who put together applications that sounded good and got people like Alan Green and Giles Fraser to ok it all. on April 21, 2015 at 8:18 am Dave Roberts. There has been a deafening silence from the loony left and Al Grauniad on this one. Surely there is no question. Rahman and his entire party must totally disown Miah immediately, and break all ties with him. As must St Hilda’s East and Blue Gate Primary School on Cable Street? Anything other than an immediate severing of all ties will force us to assume that they condone and agree with his behaviour. on April 21, 2015 at 3:11 pm Dave Roberts. It looks like Tower Hamlets First might not be a party after all. There is no reason why individual councillors shouldn’t disassociate themselves from his actions though and it will be interesting to see if any do. on April 21, 2015 at 5:29 pm Dave Roberts. Interesting developments in Bradford reported on http://www.tendancecoatesy.wordpress.com that lead me to believe that either Ed Miliband has had words with Livingstone or that his newtness has descended even further into alcohol and self delusion. After several years of supporting Respect and Lutfur Rahman in particular it seems that the former dictator of London is now campaigning for Labour against Galloway. This should make for some interesting confrontations. Both men are totally unscrupulous and unprincipled and I wonder if Bradford is large enough for both egos. It is also interesting why the Labour Party thinks that the London centric Livingstone has any pull at all in the north. It will be interesting to see what Galloway and whats left of Respect make of Livingstone’s change of allegiance. It is about six months ago that both of them were the stars of the surreal drama at The Waterlilly Centre in East London in support of Rahman and allegations of Islamophobia were being bandied about everywhere. It is likely that anti semitism will feature front stage in this campaign as Respect supporters are already denouncing the Labour candidate as a Zionist stooge. I recommend two books on Livingstone that show just how devious and opportunist he is. ” Turn Again Livingstone” by John Carvel and ” Ken” by Andrew Hoskin. They are available on Amazon, for the politically incorrect bibliophile, and are essential reading to understand what a scumbag the former Mayor of London really is. Maybe we can persuade Galloway and Livingstone to wrestle in a giant paddling pool filled with lime jelly and Nutella, wearing only loincloths, for the honour of being the most rotten hated champagne pseudo-socialist these islands have ever produced? Sorry, it’s been a long day, and I need my sick fantasies to keep me going. on April 21, 2015 at 7:07 pm Dave Roberts. Have a lie down GR. It could also be argued that Miliband wants Livingstone well away from London as he is hardly an an electoral asset. I would imagine no prospective Labour MP anywhere in London would want him anywhere near their campaign. The same can be said for Miliband. Have been in contact with the Tower Hamlets Election Petition people. They have incurred lots of expenditure and are in heavy debt. Although they may eventually get some money from anyone who may be found “guilty” that is a long way off. In the meantime, I would like to appeal on behave of the brave and courageous Tower Hamlets Four for donations – big and small – to help reduce their large debt. May I also ask any Tower Hamlets council persons if they would like to ask the Mayor for a really generous community contribution. Money, large, medium and small amounts will be very welcome and very gratefully appreciated by the public spirited campaigners. Account name: Tower Hamlets Election Petition Ltd.
Bank: Metrobank, Holborn Branch, 1 Southampton Way,‎ London, WC1B 5HA. Even a fiver would be appreciated, more if you can afford it. I hope the Mayor’s office and the council’s spin doctors will be a lot more generous. Without the sterling efforts of the Tower Hamlets Four, a lot of our current entertainment would never have materialised and the Mayor would not have received so much free publicity. Thank you most sincerely for your kind generosity. (nothing to do with the campaign – just promoting their splendid service to the residents of TH). Ted, I would accuse you of being credulous with the headline of this, but the story makes it a little better. Lutfur ‘demanded an explanation/apology’ when Stuart Madewell called Peter Golds the Grand High Wizard of the KKK – and Lutfur’s ‘demand’ looks as hollow here as it did then. This is the logical conclusion of Rahmanism, a movement that did not start with Lutfur but with the Iraq war and Galloway’s baleful decision to migrate here and whip things up, and it has pushed certain machine politicians to encourage a large portion of the Bengali Muslim community of the East End to view themselves as nothing but Bengali Muslims, and to view the world through Bengali-Muslim goggles, and here we are with people pushing anti-semitic filth like this and becoming bona fide candidates for the council! “Tower Hamlets First is proud of its record on standing up to racism and fascism and operates a zero-tolerance policy on any form of bigotry from its councillors and supporters…. You will be fully aware that Tower Hamlets First has always worked to facilitate understanding among faiths and cultures whilst standing up to fascism, and that we have the deepest respect for our borough’s Jewish community…. Have you been at the kosher wine? THF is a rotten, corrupt, racist, nasty, divisive, evil and wasteful political group. The vast majority of members and supporters are equally as vile. Ahad Miah is a nasty, stupid power hungry little twerp, who had posted evil and highly offensive material on his public profile. Whether it was done to garner votes, or if the stuff he’s posted is his true opinion, he still did it, and has alienated and offended many, many people in the process. He doesn’t even have the balls to just own up and apologise, but lie further, which will only add further to his undoing. Especially when he’s changing his story to suit each audience, and people are probably prepared to corroborate this if required. The fact that THF hadn’t bothered to check out his Facebook profile prior to putting him up in their name at the last council elections, really does put those on the selection panel, and ultimately their leader on par with this moronic specimen! Can you imagine the fuss that Lutfur and his cronies would’ve made if a Tory wannabe had done something similar against Islam? Finally, allowing ridiculous trips to Greece, and grant funded jollies by THF councillors, who then spout their rotten grasping ways all over the Internet, whilst taking their pet gimp Ahad along for the ride, only compounds the bad taste you leave in the public’s mouth deeper and deeper. You have convinced me make a considerable donation to the case against you and your bunch of crooks/liars/cheats/racists/idiots etc. Dear Acting S of H P, having read your lengthy posts in a rush, they sounded pro THF, when I read them again later, I realised my mistake, and the true tone. Please accept my apologies for this, and posting comments which disagree with or read negative about yours. Though my loathing of THF, Lutfur, and his new pet gimp stands. Grim Reaper – not sure if my comment tipped you in donating £500, but for the purposes of clarity, I think it’s pathetic and utter bull for THF to say they have ‘zero tolerance’ on racism, and then for the press release to fizzle out in the bathos of saying they have really cracked down on Miah by, er, asking him to delete the post and provide them (THF) with ‘an explanation’. Genuine zero tolerance would mean kicking him straight out. Normal people do not need an explanation about Adolf. Normal people shun and reject Adolf’s admirers. Normal boroughs would not have anything resembling THF. Seems to me THF is reticent about loosing another of its rapidly dwindling pool of members/supporters. Seems Hitler worship is more important to THF than normal decency and public morals. I’d wanted to contribute from day one, as I know how pricey instigating legal proceedings can be, and the risks involved. I applaud their chutzpah at putting their financial heads on the block, and wanted to show my support. I doubled my intended contribution to show my commitment, and did add a comment to show where it came from, which was removed when I ticked the anonymity box. Fingers crossed we get the right outcome, though even if they get off, the negative publicity will be worth the effort and financial cost. I also think that Ted should be congratulated for his continued efforts on this, and over the years. And also to those who are equally incensed by this lots behaviour and bother to share their views. I only wish that enough people had voted at previous elections to have prevented this situation in the first place! on April 22, 2015 at 8:02 am Dave Roberts. I know Madewell is a joke but Peter Golds should have sued. Madewell has assets and can afford to pay. I’d have loved to sat in on the case, with the jury and stenotype operator attempting to decipher Madewell’s diatribe. Wouldn’t life be strange if the Mayor looses on Thursday under S106 for vexatiously calling John Biggs a racist when the real racists are in his own party under his nose. What could he have been thinking of? To cheer us up while we wait for the judgement. If the link doesn’t work search “Lutfur Downfall” on YouTube. We would like to be one of the first web sites offering FREE downloads of this year’s most fascinating event. Just to let you Londoners know, we have election sleaze too ! Currently trying to get our council to fund a coach trip to LBTH to offer our moral support and to meet the locals who could visit us in our 5 star hotel. If things go the right way, Lutfur and co could put on an amateur production of Fiddler on the Roof? Let’s face it, they have enough experience of acting! Fingers crossed they have lots of lovely free time for rehearsals! on April 22, 2015 at 7:01 pm Dave Roberts. I can just see Lutfur in a kaftan singing ” If I were a rich man”. The other pictures appear to have been taken down now as well. However, Ahad’s story is plainly untrue. There was indeed a gap of ‘several weeks’ between pictures being posted to his account from early November 2014 to March 2015. This is the only gap of several weeks on his account. The Hitler picture was posted in July 2014 so even if Ahad had not accessed his account between July 2014 and March 2015 he still allowed the picture to remain on his account from March 2015 when he would have seen it when he uploaded a picture of his son. However, he did access his account regularly and posted personal pictures in July, August, September, October and November 2014 when he would have seen the Hitler picture on his account but did not to remove it. He was also posting on his timeline as well as uploading photos during this period. He has been caught redhanded, barefaced with his pants down and finders in the till! The lies are are just helping to dig a bigger hole for him to disappear into. Though at least he is in the right party, full of liars, cheats, crooks and racists. He won’t be lonely! on April 22, 2015 at 12:25 pm Dave Roberts. This is from Nov last year but is still interesting for the mind set of the average Trot and loony lefty. on April 22, 2015 at 1:43 pm Dave Roberts. Does anyone know how to do a screen grab as I believe it’s called? I have something that’s really good but the site owners will quickly take it down it’s so embarrassing. Yes. Done. Give me an email address and I’ll send them to you. on April 22, 2015 at 2:18 pm Dave Roberts. 3. Or use u22.net/cat to reveal the location and I’ll do my best to give you and Ted something to show the others. Easiest way is to press the Print Screen key usually located near the upper right corner of the keyboard. (It may be abbreviated to PrtScn). You can also photo with your phone and email from there…. on April 22, 2015 at 2:51 pm Dave Roberts. I’m afraid all of this is beyond me guys. It’s a bit of a laugh that should keep you chortling until the report arrives. http://www.obv.org.uk/news-blogs/xenophobia-has-poisoned-our-eu-institutions Failing this http://www.obv.org.uk and wait for it to come up. Does anyone know where the Meditation Sea is? I’ve spent the afternoon with the atlas and can’t find it. You would think with the amount of money this lot managed to disappear from the London Development Agency they could afford spell check on the computers. Speaking of the report do we have a time tomorrow? Normally these things get leaked to the press. I’ll pop out and get The Standard later. How do I post a pic in a reply on this blog? Email to Ted. Details at the top of the page. Here’s an interesting story about a teacher from Tower Hamlets who posted a picture of Hitler on-line. He could always stand as a THF councillor? He appears to have the right characteristics! on April 22, 2015 at 7:00 pm Dave Roberts. Nothing in The Evening Standard except a two page spread on Roshanara Ali and the news that it will start in the High Court tomorrow as has been said. I take it that this means that the judge will sit and read out his decision. Standing room only I should think.